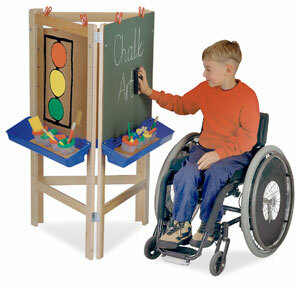 Each side of this three-sided easel adjusts from 35" high up to 46½" to adapt to young artists of varying heights. Work panels measure 24" × 24". Sturdy maple legs support the included hardboard panels. Each easel also includes clips and paint trays. Assembly is required. The entire unit folds flat for convenient storage. Lifetime warranty.